There are no reviews for the SEGA Master System release of this game. You can use the links below to write your own review or read reviews for the other platforms of this game. Having been cloned, ripped off and generally done to death, the Gauntlet formula emerges here as fresh as the first day the coin-op appeared. The bright colourful graphics and really great sound - including sampled speech, I might add - make the whole game just as playable now as it ever was. The main thing that puts this head and shoulders above practically every other Master System game available is the speed - it's got to rank as one of the fastest games around! The sprites hare around the screen with no flicker at all, which goes to show what can be done if enough care and attention is taken with Sega games. If you're a fan of the genre, or just want a brilliant game for your Master System, you could do no wrong with this. More, US Gold, please! Gauntlet has appeared on virtually every home computer system on Earth, and I'm glad to see that the Sega version tops the lot for sheer playability. The game is played at a tremendous speed, and each dungeon is packed with literally hundreds of vile and gruesome creatures all out to get you - as you can imagine, it's action all the way! As well as being very playable, the graphics and sound are also excellent. The sprites are small, but they're superbly detailed, and the backdrops are very polished, giving the game a true arcade look. With 100 different levels the challenge you, Gauntlet won't lost its appeal in a hurry. If you've got a Sega, do yourself a favour and plug this into it. Two players can simultaneously play Gauntlet. You can either assist or hinder your colleague. If you want a laugh, do both. The Sega Master version contains a few changes to the coin-op. Instead of individual player speeds you get different rates of fire, and the thief has been replaced by potion penalties. So what? Sega Master Gauntlet is an accurate conversion of a fun fantasy shoot 'em-up. Go grab yourself some maze. Une toute petite dernière chose avant de se quitter, tout comme dans Indiana Jones, Durant le jeu, il n'y a pas de musique, seuls quelques bruitages et digits sonores (un élément encore bien rare sur Master System) viendront égayer l'atmosphère un peu sinistre de Gauntlet, qui reste tout de même un excellent divertissement. Das fesselnde an diesem Spiel sind die vielen Gegner, die besiegt werden sollen. Auch die Gestaltung der Räume ändert sich durch Aussehen und verschiedene Hindernisse. Rest assured, the Master System port of Gauntlet is mad decent. But was it worth releasing in 1990? I’m not sure how many ports of Gauntlet Europe and Brazil received prior to 1990, but here in the States, you could play the game on a myriad of computers or the NES. The Master System version, had it been released here, would have been overkill and probably not sold well. That’s not to say Europe and Brazil weren’t thankful for Gauntlet‘s presence. God knows they received more than their fair share of terrible Master System games exclusive to their territories. 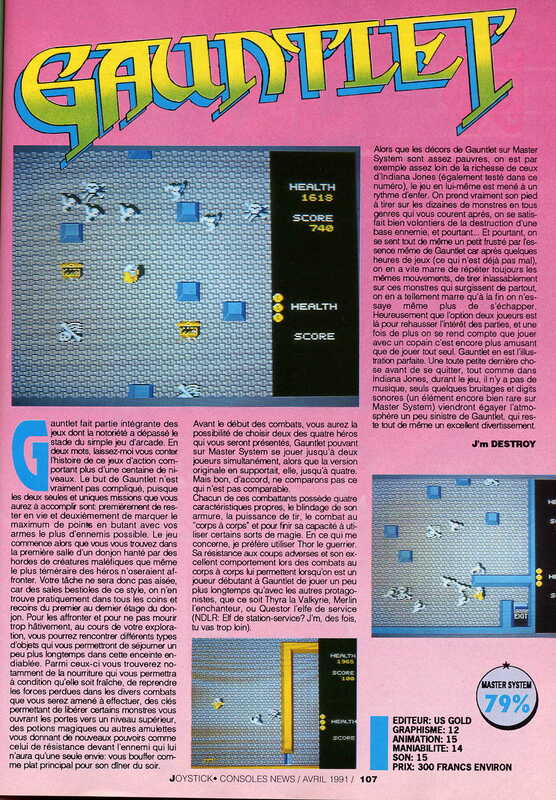 Perhaps Gauntlet buoyed the spirits of Master System fans and made them believe better games were just around the corner. Stranger things have happened. Alors que la Megadrive commençait déjà à tracer sa route, sa grande sœur accueillait encore des portages de l’arcade – et de bonne qualité, pour ne rien gâcher. La version Master System reste d’ailleurs l’une des meilleures adaptations du jeu d’Atari. Spielerisch sorgt Gauntlet nicht zuletzt wegen der netten Grafik und des guten Sounds für gepflegte Unterhaltung. Spaß macht‘s vor allem dann, wenn man zu zweit auf Punktehatz geht. Alleine wird das Monster verhauen auf Dauer etwas eintönig. The conversion's faithful to the coin-op - it's fast, furious and immensely playable. Technisch macht die Gauntlet-Version auf dem Master System gar keine schlechte Figur. Prächtige Farben, hübsche Sprites und eine gelungene Adaption des Original-Automatensounds sprechen eigentlich für Gauntlet. Leider ist das Programm spielerisch auf dem Stand vor vier Jahren stehengeblieben. Während andere Gauntlet-Fassungen mit neuen Spielelementen aufwarten (z.B. die amerikanische NES-Fassung) wurde dies leider beim Master System versäumt. Die Folge: Schon nach kurzer Zeit stellen sich die ersten Ermüdungserscheinungen ein, und das Modul verschwindet im Regal. This is a faithful representation of the arcade classic and it stands up very well against the other 8-bit versions, which have been around for years. Die größte Freude am Spiel kommt noch beim Two-Player-Teamwork auf, da der Spielablauf auf die Dauer doch recht ermüdend wirkt. Daran ändert leider auch die Sega-atypisch gute Grafik nichts, die von sparsam eingesetzen Sounds unterstützt wird. Technisch ist GAUNTLET up to date - spielerisch jedoch rieselt schon der Putz aus den Keller-Gewölben. Der Zahn der Zeit hat auch hier genagt.